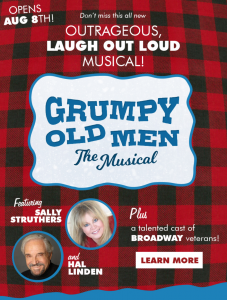 Ogunquit Playhouse’s U.S. premiere of Grumpy Old Men the Musical will play the Maine venue August 8–September 1. Based on the hit film that starred Jack Lemmon, Walter Matthau, and Ann-Margret, the new musical was penned by Dan Remmes, with music by Neil Berg and lyrics by Nick Meglin. Matt Lenz directs a cast that features Ed Dixon as Max, Mark Jacoby as John, Tony winner Hal Linden as Grandpa Gustafson, Sally Struthers as Punky, Leslie Stevens as Ariel, Brenda Braxton as Sandra, Doug Eskew as Chuck Barrels, Kevin Massey as Jacob Goldman, and Laura Woyasz as Melanie Norton. The ensemble includes John Battagliese, Blake Hammond, Eric Jon Mahlum, Kelly Methven, James Taylor Odom, Heather Jane Rolff, Brooke Singer, and Christina Tompkins. The creative team also includes associate director Anthony C. Daniel, choreographer Michele Lynch, music director Phil Reno, scenic designer Michael Carnahan, costume designer Dustin Cross, wig, hair, and makeup designer Brittany Rappise, sound designer Kevin Heard, and lighting designer Richard Latta. Individual tickets are on sale now at OgunquitPlayhouse.org.